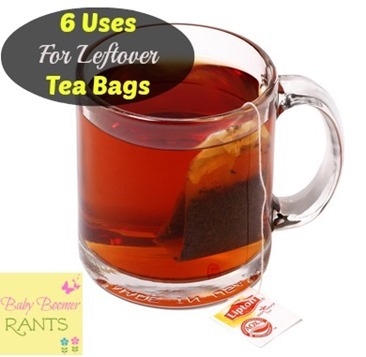 6 Little Known Uses For Leftover Tea Bags! You are here: Home / Family Living / Household Hacks / 6 Little Known Uses For Leftover Tea Bags! I was browsing online one day and noticed there were a lot of articles on how to reuse everyday things, so I started thinking about what we use every day and tea bags came to mind, as did coffee filters! That led to me writing this post, I have found 6 uses for leftover tea bags you might want to try! I found everything from treating puffy eyes and sunburn to removing odors! Be sure to pin this and save it for later – you never know when you’ll need it! 12 Uses For Leftover Coffee Grounds! 12 Everyday Uses For Dawn Dishwashing Liquid! 18 Everyday Uses For 20 Mule Team Borax! Here’s the roundup of things you can do with leftover tea bags! Soak tea bag in hot water, apply to wart 10 minutes 3-4 times a day. You should see results in 2-3 days. Soak tea bags in ice water, then apply to closed eyes as a compress. Leave on for 20 minutes. Apply used tea bags directly to burn, or add a few tea bags to bath water and soak for an overall sunburn. Apply wet tea bag to affected areas to soothe the burn, also works for knicks. Apply used tea bags to insect bites to soothe the itch. After chopping onions, wash hands in tea to remove the odor from your hands. Great tips! I drink A LOT of tea. This is a great way to use the leftover leaves! Thanks! If you have a Thermos that needs to be deodorized fill it with water and a teabag.Let it sit for awhile. Helps get rid of the “stinky”. Margaret – that’s a great tip!